How to Download Vimeo Videos Mac: Vimeo Downloader Mac. How to Download Vimeo Videos Mac? Vimeo is the popular community online consisting of people with creative minds who are making their own videos that they will share to the whole world. Today, everybody can already download a video from Vimeo provided that there is the download button at the bottom of the video. But if you cannot find it, you will need to use some special tools that are designed to help you download Vimeo videos Mac. Total Video Downloader for Mac is a very easy to use Vimeo downloader Mac that has ultra fast download speed. Through the use of this professional Vimeo Downloader Mac, you can download a lot of videos in various resolutions and formats. You can get them all from all online video sharing sites like Vimeo, YouTube, Facebook, and so on. This is the ultimate solution to your problem if you cannot find a download button under those videos you really want to get online. 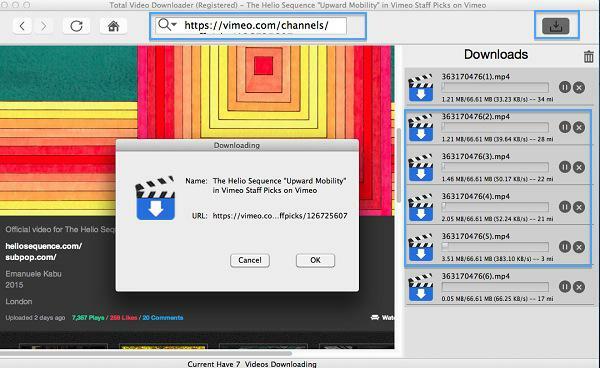 This Vimeo Downloader Mac will do the job for you. All you have to do is to copy and paste the link of video to Total Video Downloader that will automatically pop up the download box. Download and install this Vimeo downloader on your Mac today so that you can immediately download Vimeo videos Mac. 2 One Click to download Vimeo videos Mac. You can directly copy and paste your favorite Vimeo video URL to this ideal Vimeo Downloader Mac, then tap "Enter"! As Total Video Downloader has a built-in browser, you can also browse Vimeo site with this Vimeo Downloader Mac, look for and play the video you want to download. When you start playing the video, the Vimeo Downloader Mac will pop up a download box to ask you to confirm your download! 3 Manage the downloaded videos in your local "Movies" folder. When the Vimeo Downloader for Mac completes Downloading Vimeo Videos Mac, you can click the "Magnifying Glass" icon. 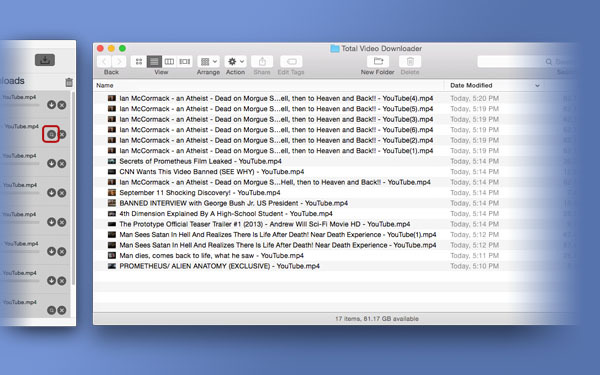 This Vimeo Downloader Mac will locate the downloaded video in the “Movies” Folder of the system, thus you can easily find the Vimeo videos you downloaded and enjoy them anytime and anywhere. There are some videos uploaded on Vimeo that come with a download button that you can see at the bottom of the video. With this, you can start downloading the video you want without the need for using any downloader and you will not be forced to register before you can finally get what you require. 1. Find the download button within the tool bar. You hit the download button so that you can expand the options to download the video in various sizes and resolutions. Depending on the source, you may download the video in formats such as MOV, FLV, or MP4. 2. Start downloading the video and do not click the title of the video. Instead, you should right click that and then select the “download linked file”. The Vimeo video would be downloaded in the background.